Should My Facebook Page Be Personal or Profession in What I Share? Should My Facebook Page Be Personal or Professional in What I Share? Facebook has done well for me in a lot of ways. It’s made a person who ordinarily struggles to reach out to friends actually keep in contact. And my facebook page is more than just a portal to my personal contacts. It’s been a great marketing tool also. I’ve been allowed to share my business with clients, potential clients and colleagues. I’ve shared this blog, helped inspire and teach other voiceover pros and “newbies and I have also learned a lot from you guys. But with 1584 friends to date, admittedly I don’t know even half of the people on my friends list. While I wanted to have a space where I could share personally with friends and family and professionally with contacts and colleagues, those two things often conflict. My ideas, ideals and even sometimes elements of my lifestyle are not always agreeable with professionalism. Striking a balance between self expression on a page that “I own” and posting the happy go lucky kind of post that don’t scare off those who write the checks or support my blog, is tough. There are things that I have passions for outside of my career like social justice which make some people “uncomfortable.” I can hear them in my head everytime I post video of police misconduct saying “Why is Dane SO political?” And perhaps that cost me a few readers. Maybe even a few dollars. But I decided that awareness and activism was more important. But then I learned the harsh reality of facebook algorithms and the happy happy online community. For the most part, FB chooses who you will interact with based on what they think you like and filters much of what you don’t. So what does that mean for my activism? What does that mean for my business? It means that over time they have learned me and that they have learned all of my 1500+ friends. And they have picked who not to show my post regarding either. And they have slimmed down the number of people in which I interact with to about 50 people. Still 1500+ people still have access at anytime to what I write, to what I do, to where I am in the world and to who I date (which is the reason I don’t post my girlfriends name and am not linked to her in social media). I post unboxings of new equipment. Information about my birthday, where I grew up, my first pet and sensitive info is all on facebook and can be a hackers dream. And without thought, we give it away at random friend request. We tell who our other friends are and fill out these random surveys for kicks and giggles providing our info to anonymous app companies without thinking that sometimes this is the same info we use to recover passwords and access Equifax reports. With all that in mind I have decided to evaluate how I use social media. I post less of my thoughts and info about my personal life. I’ve covered up my friends list to protect others from hackers and profile thieves. And I participate overall less, which has refocused my energy on my business and personal peace and less on the frequent debates they I found myself in. Additionally I’ve suspended accepting every friend request, often taking a month or more to even look at new friends. While I’ve accepted 100 new friends this year, according to fb, I have rejected 2 to 3 times that many, instead choosing myself who I’ll actually interact with so facebook won’t have to do it for me. And I’ve even started eliminating friends who don’t interact with me or post things frequently that I strongly differ with. This filter system has slowly been working for me. And recently I was reminded of exactly why I began rejecting people as friends. When a recent request by someone in my industry was rejected, I was childishly confronted through messenger by the rejected “friend”. I screened this person’s (Dan B.) page and found that while we were in the same industry, we were not of the same mindset. I found some of his post offensive and decided that we would not be a good match as friends and based on his follow up, my instincts were right. He attempted to dangle a carrot at me as if not being friends with him cost me a job as an “African American Voice” not knowing that I was touring Europe with little time to dedicate to new clients. So I suggested he find someone else. While I could go on about the individual issue with Dan B, he is more just a symptom of the problem we face as professionals on social media. Who do we let in? What do we let out? And how do we decide? I have decided that less is more. To reach me professionally please go to my website at http://www.danereidmedia.com/contact/ or twitter.com/danereid or linkedin at https://www.linkedin.com/in/danereid/. But to be friends, please wait in cue and endure the process. 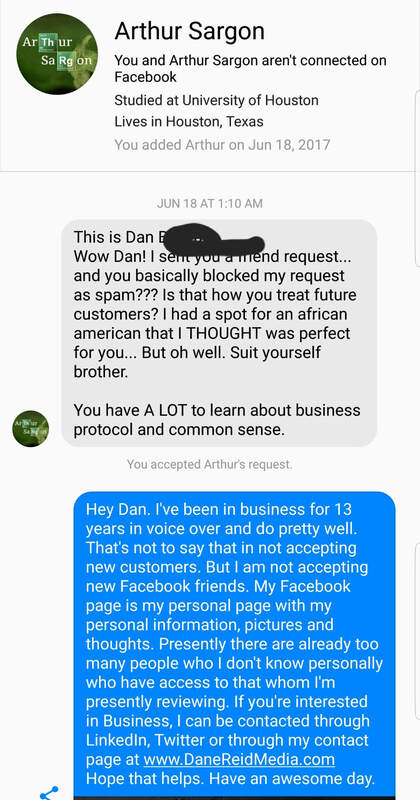 As for Dan B, someone let him know I’m doing just fine.